anti extremism begins at home – welcome! I TOTALLY agree with most of what Prime Minister Najib Razak recently said at the United Nations (UN) General Assembly, especially about the attempts in some parts of the world to demonize Islam and spread Islamophobia. I find it alarming to see so many e-mails and videos being circulated warning people of the dangers of Islam and propagating the fear that, with the Muslims multiplying at the current rate, they would one day outnumber people of other faiths and take over the world. This kind of fear propagation reminds me of that practiced by Mahathir Mohamad when he warned Malays that they would lose power to the non-Malays, especially if Pakatan Rakyat takes over the government. It’s destructive. It appals me that even Malaysians are instrumental in spreading Islamophobia by forwarding these e-mails. When I get one, I often reply to the sender to tell them not to disseminate such hatred. I tell them this problem has arisen because of misunderstanding of history, and that these e-mails don’t tell the other side of the story, which is the plight of Muslims who have suffered because of the historical events fashioned by imperialists. These answers are so distorted, blinkered and untruthful that they are not worth rebutting. The danger lies in e-mails such as this being received and accepted as the truth by millions of people who don’t know what Islam is about. I am not a subscriber of organized religion, but I believe in the right of all religions to exist. I also believe no religion should throw mud at another and claim to be truer than any other. The only way to resolve the differences in the world today is to get all sides to sit down at the table and discuss. Perhaps the US should even sit down with al-Qaeda and thrash it out, peacefully. Why not? These two are the major causes of the mess the world is in today. If they can talk, instead of fight, we might get some peace. He also said, “We must choose moderation over extremism”, which I readily agree with. But then why doesn’t he deal with the racial extremists that exist in his own country? Nothing has been done about the school principals in Johor and Kedah who allegedly made racist remarks despite the calls from several quarters, including the MCA, for action to be taken immediately. Hasn’t the lack of action dragged on for too long? Ironically, as Najib was calling for moderation at the UN, a Biro Tata Negara (BTN) assistant director named Hamim Husin was reported to have made racist remarks at a meeting with Puteri Umno members. He now claims he did nothing wrong because it was a closed-door meeting, but any sensible mind would figure out that this is not an excuse. He was not talking to friends. He was talking in an official capacity in an official situation. In any case, it’s not a matter of closed-door or public. He has to be responsible for what he says. Racism is racism, whether it is in the public sphere or over the dinner table with your family members. So, what action will be taken on this matter? Of course, we know that Najib was talking about religious extremism at the UN, but, outside that, and to be consistent, he should hold the same standard for racial extremism. Especially in his own country. He said we should “work together to combat and marginalize extremists who have held the world hostage with their bigotry and bias”. So why doesn’t he apply this to the extremists who hold Malaysia hostage with their bigotry and bias? Why does he let an NGO like Perkasa oppose what needs to be done for his New Economic Model (NEM) and Economic Transformation Programme (ETP)? 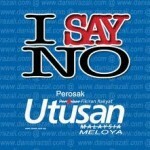 Why does he accommodate their objections even when he knows that they stand in the way of a brighter Malaysian future? At the UN, he also said the world had “allowed the ugly voices of the periphery to drown out the many voices of reason and common sense”. Isn’t that what is happening in Malaysia as well? Almost every day, we hear “the ugly voices” of Perkasa denouncing this person or that person for saying something it dislikes, including people like MCA president Chua Soi Lek. Every now and then, Perkasa would run to the police station and make a report against someone for making a seditious statement. And the odd thing is, the police would usually take follow-up action and call that person in for interrogation. But when Perkasa says and does anything that could be deemed seditious, no action is taken against it. A week or so ago, some Perkasa members protested outside the venue where the Chinese rapper Namewee launched his debut album. They also burned posters of the artist. They challenged him to come out and meet with them. They said they just wanted to talk. If all they wanted was to talk, why did they burn those posters? And why did they call themselves “hulubalang Melayu” (Malay warriors) and “panglima perang” (commanders of war)? And why did they vow afterwards to hound Namewee wherever he went? This was obviously a racially motivated act calling for “war”. If it wasn’t a threat to public peace, what is? But the police did nothing about it. Well, so much for Najib’s call at the UN to “reclaim the centre and the moral high ground that has been usurped from us”. When he comes home, he’ll have to get down to the ground and reassess his moral position. Or he might find his own position usurped by forces going out of control. One Response to "anti extremism begins at home"
Our PeeeM can just talk and talk and talk only. So far what actions has he taken 1) those racialistic lazy dickheads in Perkasa 2) the SOB bigot from BTN 3)the so called headmasters/mistress racialistic remarks just to mention a few.